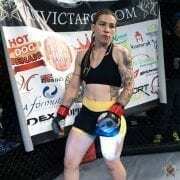 Undefeated newcomer DeAnna Bennett looks to continue her upward trend, when she scuffles with Michelle Ould September 6th at Invicta FC 8. Corey Smith: What initially attracted you to the world of martial arts? At what point did you decide it was something you wanted to pursue professionally? DeAnna Bennett: In high school I was on the water polo team and one of the assistant coaches was also an assistant coach for the wresting team. He convinced me to join the team and I am so glad I did. I absolutely loved it. DB: Then a few years later I found myself in Utah and took a kickboxing class in college (I needed the credit) and I liked it so much I joined the local boxing gym. That gym closed when a bigger one opened next door to it and I went over there. DB: If I have to say, it was probably when I entered the cage for my first amateur fight. I fought Ariel Endsley on Jeremy Horns Elite Fight Night card and I was hooked. CS: Most MMA athletes have a home gym in which they spend the majority of their time. What gym are you currently training out of, and what makes you call it home? DB: I train out of the Pit Elevated in Orem, UT. And, as cliché as it is, my team makes me call it home. And even beyond just my team, the people who work there and even just the general members make it my home. DB: Everyone there is great. My team really is like my family and they are always so supportive and do everything they can to help everyone succeed. CS: You are currently undefeated, with wins over several TUF alumni. How important is it to you to remain undefeated versus facing higher caliber competition in order to improve? DB: I wouldn’t choose one over the other. I don’t want to hand pick my opponents just to maintain an undefeated record. I’d much rather push myself and fight high caliber opponents all while keeping my record intact. DB: Even if I did happen to find myself not on the winning side of a fight against someone high caliber, at least I know that I can take that as a learning experience and use that to push myself in my next fight. CS: Your nickname is the “Argentine Assassin,” yet you currently reside in Utah. Is the nickname a result of your heritage or were you born and raised in Argentina? DB: Yes, about that. Haha. Well, to preface this story it is a result of my heritage. My mother was born and raised in Cordoba, Argentina and lived there until her late 20’s. The nickname came from when I was fighting Julianna Pena. DB: Moral of the story, don’t joke with fight promoters because the next thing I knew he used it for the show and it ended up everywhere so I am stuck with it. DB: I won’t complain too much though because I love Argentina. It’s a beautiful country and the heritage I predominately identify with. CS: On September 6th at Invicta FC 8, you face off against the very experienced Michelle Ould. What are your expectations of yourself for the bout? DB: I know this is going to be a tough fight and I definitely look forward to it. She has had a lot of fights and has been doing this for a long time and I am excited for the challenge. DB: I am just going to train my hardest and go out there to do my best. Make it a good show for everyone. DB: Is excitement a mood? My only routine is that I take my really long prefight bath and have my friend Brittany braid my hair. DB: My head Coach Jason Mertlich is always in my corner as well as my boyfriend/training partner Trever Mellen. DB: I will take any feedback from my coach Jason because I know he will never steer me wrong and is hands down the best coach anyone could ask for. If he tells me to do something, I trust him and will do it. DB: I watch a lot of MMA. I love this sport and love to see different fighting techniques and see what I can take to help myself be a better fighter. DB: Wait; there is an outside of MMA and the gym? Just kidding. I love hockey. I’ve played since I was 11 year old, unfortunately I haven’t been able to play in a while, but I still love it. I keep hoping to free up some time to play one of these days. DB: If I can’t play it, I can still love my team, the San Jose Sharks. They made me real sad this last year in the playoffs, but I still love them. DB: I also love mountain biking. There are a ton of great places in Utah to go mountain biking. I also love to swim. I’ve done it my whole life and I can swim for days. DB: I find reading relaxing and I love to sit back with a good book, no specific genre, I love fiction, non-fiction, whatever I’m really feeling at the moment. DB: I would like to thank my coaches, Jason Mertlich and Arnold Anderton. They spend so much time away from their families working to help us get better and succeed and words can’t describe how grateful I am for everything they do. DB: I also want to thank all of the Pit Elevated fight team, all the guys and girls there; I wouldn’t be who I am without them. DB: Will Ferrar for giving all of us there a beautiful gym to train out of and always supporting us. DB: Dr. Dustin Drussel for helping to keep me in one piece, Arthur Kleinfelder as well. Rob Roveta and Scott Bowler for helping me out so much. DB: The guys at Pro Formulations Labs for supporting me too and feeding me Warrior Fuel. DB: Bas Rutten, Dynamic Fastener, and Vivint Home Security (my day job) for supporting me in this fight camp as well. DB: Also all of my friends, family, and supporters, y’all make it possible to keep going even when I get a bit discouraged. DB: And lastly, but definitely not least Trever for putting up with me when I’m hangry (hungry+angry), it’s a difficult feat, but he manages it.